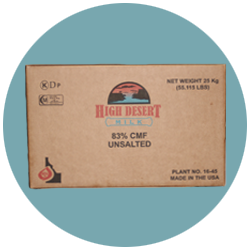 The High Desert Milk team is focused on giving customers the highest quality products available. 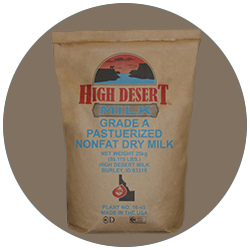 High Desert Milk offers products that are Grade A, Kosher, and Halal certified. All our products are rBST free. 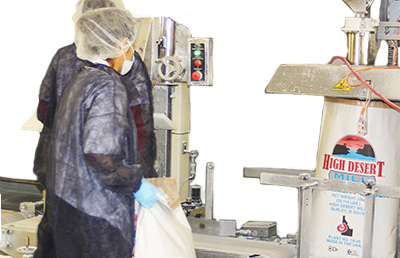 High Desert’s production process and commitment to clean, young milk allows the company to offer one of the lowest thermophilic spore-count powders available, with the option of heat stability in its powder products. Pricing similar to the market pricing found on the CME Group, Global Dairy Trade, and NDPSR websites. All our products are rBST Free! Buttermilk Powder is manufactured from the buttermilk of cream that has been pasteurized before churning. The buttermilk is concentrated through evaporation and spray dried. Nonfat Dry Milk is manufactured from fluid skim milk that has been separated and pasteurized from fluid whole milk. The product is then concentrated through evaporation and spray dried. Skim Milk Powder is manufactured in a similar process to Nonfat Dry Milk. Skim Milk Powder has an additional process where pristine milk lactose is added to the fluid milk in order to standardize protein to meet international specifications. 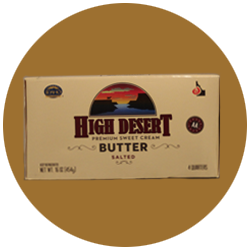 The cream and butter complement High Desert’s milk powder, as it comes from the youngest, freshest milk in the dairies. Like the milk powder, it also maintains its nutritional value as it contains protein, calcium, and fat soluble vitamins A, D, and E.
The butter is produces in a 14,000 square foot (1,300 square meters) butter plant adjacent to the main plant. 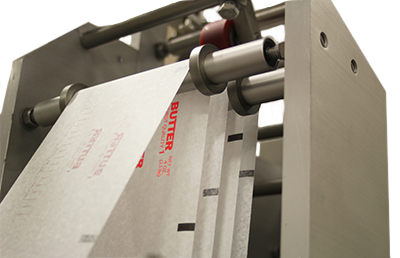 The butter plant has been designed for easy sanitation, which allows for butter production in a clean and controlled environment, allowing for a consistent outstanding product. 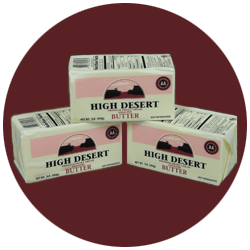 High Desert Milk’s butter is never frozen on site so you can enjoy fresh, natural butter, and a flavor that stands out. It is maintained in the warehouse at a constant temperature of 38 degrees F (3 C) until it is ready for transportation. However, if you are interested in freezing services, they are available nearby. 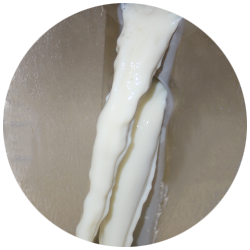 The cream used for the butter making process is generated internally through a cream seperation process. 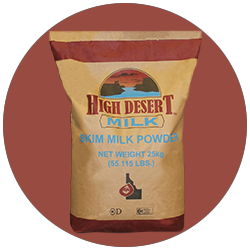 High Desert Milk has the ability to produce and ship cream in its pure state, or develop it into a variety of milk fat products. Grade A Concentrated Skim Milk is made from Grade A skim milk which has been pasteurized and concentrated by partial removal of water. Concentrated Skim Milk is light yellow to white in color with a sweet clean dairy taste. © 2017 High Desert Milk. All rights reserved.